Co-hosted by the ZOOTOPIA family from U2.com. Chat it up with your favourite Zoo mods, win giveaways and prizes! 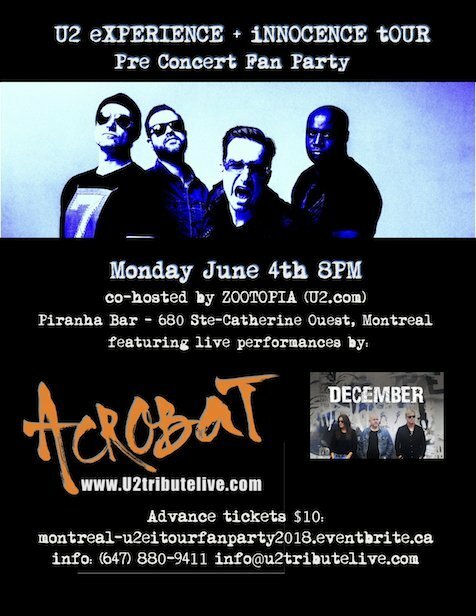 ACROBAT will follow with fan favourite U2 tracks including many songs never played by the band before. Only a few minutes walk from Centre Bell!! Just wanted to thank everyone that came out to this event! WE THREW AWAY OUR OLD SETLIST, in order to make the Fan Fest setlist more special! It is alway incredible to feel the love from U2 fans hearing U2 music. I can only imagine how U2 themselves feel.